I love this time of year. Pumpkin time! 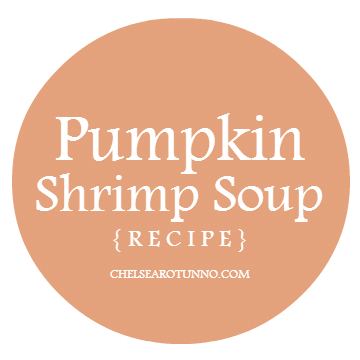 My family especially loves pumpkin treats, like pumpkin eggnog, pumpkin cookies and cupcakes, like this cake/cupcake recipe I posted last fall, and pumpkin shrimp soup. 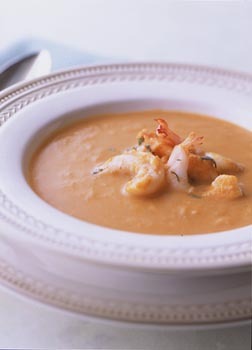 Pumpkin shrimp soup is so good! I will say, it helps if you are already a fan of curry, because it definitely has that ginger-and-garlic base to it. You also have to like shrimp. I know I’m not supposed to have a ton of shrimp while I’m pregnant, but I was craving this soup. Ginger is always good when you are pregnant. And lots of vegetables. I find this recipe to be fairly easy and totally worth it. My girls beg me to make this soup! But my kids love Indian and Thai food. If your kids won’t eat exotic foods, you may want to make this soup as a special treat for you and your spouse. 1. In a large saucepan, melt the 2 Tablespoons butter. Cook onions, carrots, cilantro, ginger, allspice, and minced garlic in hot butter, covered, for 10-12 minutes, or until vegetables are tender, stirring occasionally. 2. Transfer vegetable mixture to a blender container and add 1/2 cup of the chicken broth. Cover and blend until nearly smooth. 4. Serve topped with sour cream and cilantro. Enjoy the fall flavors! I hope you have leftovers because, like most soups, it’s always better the next day. Thank you for joining me for this special series in October. I am posting every day this month for the nester’s 31 Days of Writing challenge. If you missed my previous posts, start here.